Hello, lumplings! If you’re anything like your beloved Uncle Zombii, you have lots of these plain old glass vases laying around, leftover from condolence bouquets you’ve…”obtained” over the years. Well why leave them sitting around gathering dust, when you could turn them into charming, vintage inspired Halloween centerpieces for only pennies? They brighten up even the coldest crypt with classic orange and black, guaranteed to lull your guests into a false sense of security. To begin, cut strips of crepe paper about 2 inches longer than the height of your vase. How many you need depends on the size of your vase. I recommend eyeballing it, then cutting a couple extra. 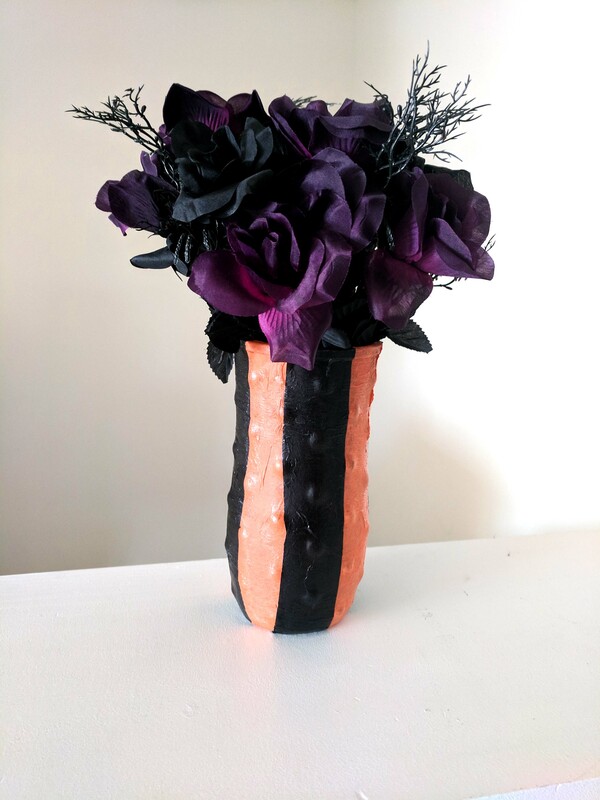 I like to cover the entire vase in orange first, then overlay it with black. How do you cover the vase, you ask? Well that’s the sticky part. The way I do it is to use an old paintbrush and paint the side of the vase with Mod Podge. Go easy, right now we just want enough glue to hold the strips of crepe paper in place. It’s easier if you only paint one strip-width of the vase at a time. Lay a strip of orange crepe paper on top of the glue. Now, dip your finger (or fingers) into the glue and smooth the paper down onto the vase. Be very careful not to tear the paper. Repeat this process until the entire vase is covered in orange. Then allow it all to dry completely. Next, repeat the process with the black crepe paper, leaving spaces for the orange to show through. 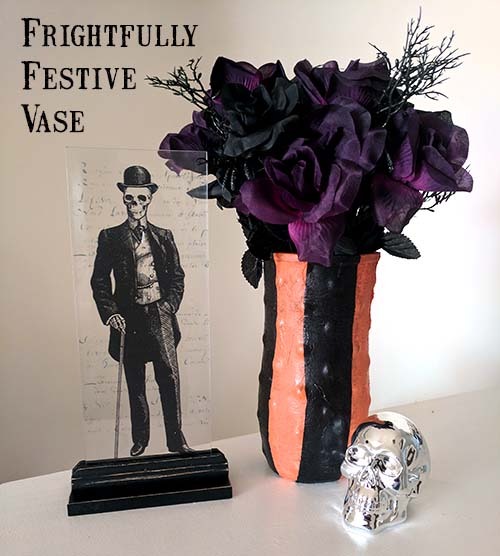 Let the whole thing dry, add some black and purple roses and there you go, a creepy chic centerpiece that’s sure to impress!